These funds have outpaced the S&P 500 this year and should do well in coming years. NEW YORK ( TheStreet) -- Small-value funds have been sailing ahead this year, returning 13.5% and outpacing the S&P 500 by 6 percentage points, according to Morningstar. Can small value continue winning? Richard Bernstein, portfolio manager of Eaton Vance Richard Bernstein Multi-Market Equity Strategy Fund ( ERBAX, believes it can. He says that small value should lead the markets for the next decade, outpacing Chinese stocks and other hot segments. While the Eaton Vance fund is new, Bernstein is no novice. For two decades, he served as an investment strategist for Merrill Lynch, gaining attention by making a series of dead-on market calls. Bernstein jokingly attributes his success to an investment philosophy that resembles the techniques of a Mafia loan shark that seeks out the most desperate clients and charges them high rates. In a similar fashion, investors can get the highest returns by finding unloved sectors that face shortages of capital. In the late 1990s, Bernstein made one of his most notable recommendations, urging investors to avoid hot Internet stocks and focus on ice-cold commodity and energy companies. At the time, investors were racing to buy technology stocks, while venture capitalists competed to fund start-ups. Meanwhile, natural resources stocks languished. Companies could not raise capital to build new refineries and mines. Bernstein's forecast proved on the mark. During the past decade natural resources funds have returned 12.6% annually, while technology funds have lost 6.6%. Now he says that small value funds have all the earmarks of a sector that is suffering from capital shortages. Banks have no interest in loaning to small companies. Venture capitalists are rushing to fund wind turbines -- and ignoring small financial and industrial businesses. Whether or not Bernstein's argument is on the mark, there is a strong case for holding small-value stocks over the long term. Since 1978, the Russell 2000 Value index, a measure of small value stocks, has returned 13.1% annually, outdoing the Russell 2000 Growth index by more than 4 percentage points. Academics say that the outperformance is no short-term fluke. Growth stocks tend to be overvalued, and they can fall a long way when earnings disappoint investors. When small value stocks stumble, they don't fall far. Avoiding big losses, value wins the day. To try small value stocks, look for a fund that has delivered consistent results. A solid choice is Queens Road Small Cap Value (QRSVX), which has returned 5.6% annually during the past five years, outdoing 78% of its peers and outpacing the S&P 500 by 3 percentage points. Portfolio manager Steve Scruggs likes companies with strong balance sheets and steady niches. He buys when the stocks are depressed because of temporary problems. A favorite stock is Immucor ( BLUD, which makes equipment that is used to manage blood in hospitals and donor centers. The company has a strong balance sheet and dominates a reliable niche. But the shares were pummeled after inspectors from the U.S. Food and Drug Administration cited the company for violating manufacturing standards. Scruggs argues that the regulatory problems involve temporary issues that can be solved. He also likes Hurco ( HURC - Get Report), which makes computerized machine tools for metal molds. The company has no debt and a big cash stake. The recession has hurt sales and profits. But the company has loyal customers because the equipment is easy to use, says Scruggs. Sales in Asia are growing, and profits should rebound as the economy recovers. 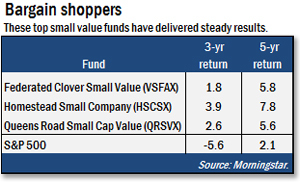 Another steady fund is Federated Clover Small Value ( VSFAX - Get Report), which has returned 5.8% annually during the past five years. For diversification, portfolio manager Lawrence Creatura holds a mix of different kinds of stocks. Some holdings are cyclical businesses that fell out of favor when their industries slipped. Other stocks are unloved companies that can grow steadily in the future because of competitive advantages. A cyclical holding is FreightCar America ( RAIL - Get Report), which makes railcars that are used to haul coal and other commodities. Sales have collapsed because of the weak economy. But the company holds $11 per share in cash, a big cushion for a stock that trades around $27. Creatura says that FreightCar dominates its niche and thrives when the economy booms. In 2006, the company earned around $10 a share. Now orders are beginning to recover. "This is a deeply cyclical business that is coming up from the bottom of a cycle," he says. Creatura also likes Skechers ( SKX, which makes casual shoes and clothing. He says that the shares sell for a price-earnings ratio of only 7 because investors worry that earnings could be hurt by changes in fashion. Creatura concedes that some lines could prove to be duds. But he argues that much of the business depends on reliable sales for shoes and other products that customers purchase year in and year out. "At the heart of this company is a reliable consumer staple business," he says. A top-performing fund is Homestead Small Company ( HSCSX - Get Report), which returned 7.8% annually during the past five years. The fund snapped up deeply depressed shares in the downturn and scored big gains when markets rebounded. In 2008, portfolio manager Peter Morris bought retailer Nordstrom ( JWN - Get Report) after the shares fell so far that the chain slipped into small-cap territory. Morris sold the shares after they rebounded. These days Morris holds many boring cyclical companies. A favorite holding is Westlake Chemical ( WLK - Get Report). The recession depressed chemical sales, but Morris says that eventually demand will recover. Investing is the best way to create wealth - here's how to get started. It's 2019, and there are now dozens of options to trade stocks online or on your mobile phone. What are the best free stock trading platforms in 2019? And which should you choose? Buying gold is easier than you may think - but you have to do your homework first.